Born and raised in the UK, Edward has lived in Phuket for 5 years now. A student of SEO, Marketing and IT, Edward loves all things tech! If you see any problems with our website, online content, or just want to know how to stay in contact through Facebook, Twitter or our Newsletter, Edward can help you out. Past guests of Serenity Resort & Residences Phuket and frequent travelers will know that you always get a better deal booking direct… The deal just got better! 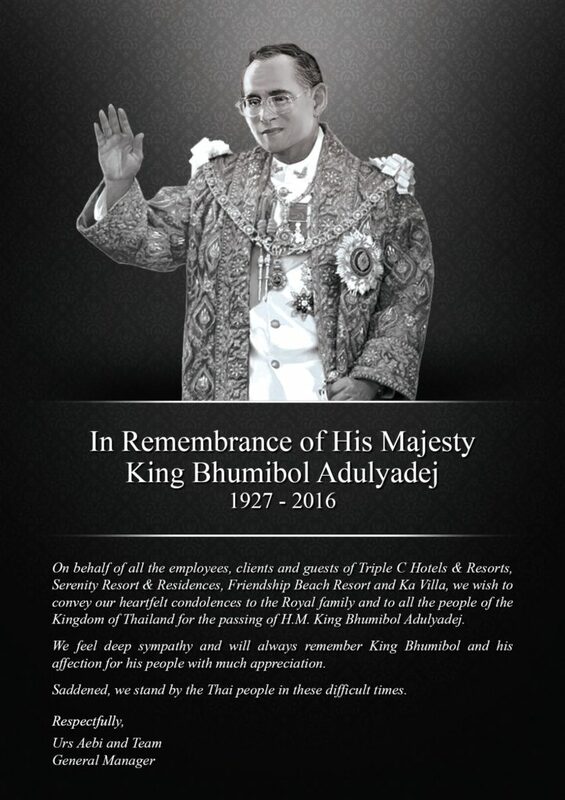 Click on the link below for recommendations from the Tourism Authority of Thailand regarding the Mourning Period for His Majesty King Bhumibol Adulyadej. The media have been reporting a series of bomb blasts in Southern Thailand over the past 24 hours, claiming the lives of 3 people and injuring several others. Serenity Resort & Residences Phuket will once again become the home of football in Rawai Phuket for the upcoming UEFA EURO 2016 Football competition in France. Watch all the footballing action live between June 10 2016 and July 10 2016, on jumbo projector screen and support your nation from the comfort of the Beach front Balu’s Bar lounge with a fantastic selection of tempting food and beverage offers. Visit Phuket Island and find that there are many great, fun things to do and places to visit on your next family vacation. Phuket is probably the most accessible of Thailand’s island destinations and it serves as the gateway to the world famous Thai islands, national parks, and beaches. The waters and scenery in and around Phuket are truly magnificent and are best enjoyed on board a boat of yacht. Taking a yacht trip to some of the spectacular sites like the National Marine Park of the Phang Nga Bay and Krabi is highly recommended. Other than these destinations be sure to check out Koh Racha lies to the south of Phuket Island. There are also many other water activities that you can enjoy as you discover the beauty of the Andaman Sea.